Pandora Lifestyle hotel looked like my kind of place. Even Darren said that. A quirky looking boutique hotel, which served fruit and veg juices for breakfast. It certainly appealed to my healthy side. We arrived just after lunch time, having caught the early Seatrans ferry from Koh Tao. The hotel was easy to find, on the main road into Chaweng. Being brightly painted in orange and purple probably helped, too. On arrival, reception was unmanned, and after waiting a while for a staff member to book us in, we set off to find one. We should have guessed. She was eating. After the passport photocopying formalities, in which I spent the time browsing the natural products for sale, we were shown to our room, (number 8), a very clean space, which could be lit up in any colour of our choosing. The remote control was explained to us in depth. Our room rate included breakfast. 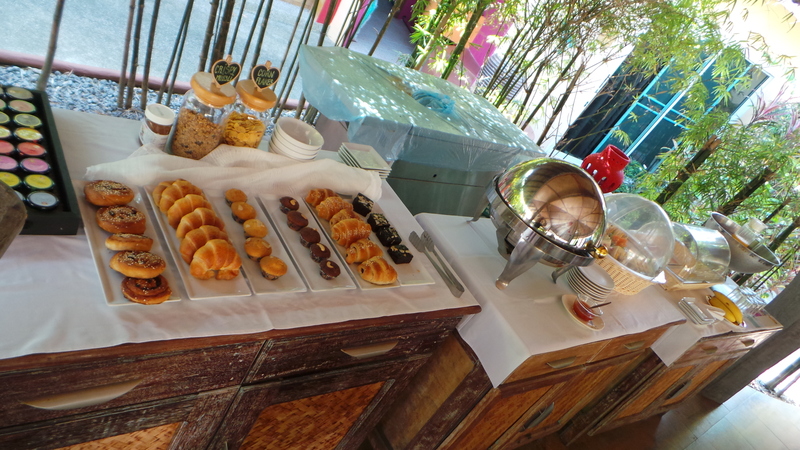 There was a substantial menu, with offerings both from a buffet, and from the kitchen. I have to admit to ordering the French crepes each morning, but they were delicious. As were the jam selection which I used to top my breakfast. To the person who invented coconut jam. I salute you! Darren was equally impressed with him bircher muesli. We enjoyed proper coffee with our breakfast, cappuccino even. The fresh fruit smoothies had been crossed off the menu, sadly. And I also couldn’t get an iced green tea. Apart from the daily breakfast, the hotel doesn’t have a restaurant, but it does serve a set snack menu, which includes a daily salad, sandwich, fruit platter and pastry trio, for 250 bhat (approx. £5) There was a menu of fresh juices, too. The hotel has some pretty gardens, a concrete jungle with pretty plants and ornaments. 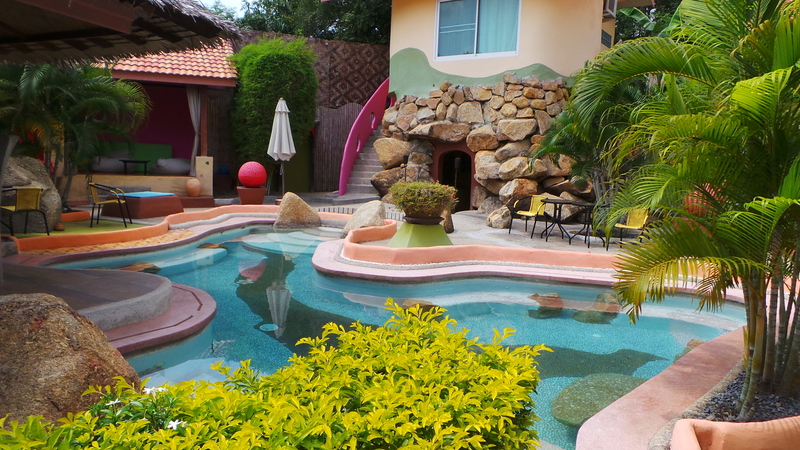 It also has a pool, more of a pond, with no sun beds, but rarely busy. The staff deserve a special mention. A friendly and very caring bunch, they certainly had time for a chat, including the French owner and his wife, who made us feel very welcomed. Unfortunately, our trip to Samui was more eventful than we had planned, with a trip to the International Hospital after a moped accident (which luckily, wasn’t our fault!) On arrival back to the hotel, the lady on reception came in to our room after just a few minutes to check we were OK. Darren asked for something antiseptic to help wipe my back with. She came back with supplies (from the reception sales it looked like on a quick glance) and a steady womanly hand, taking Darren’s place to wash my back, legs (and bum cheeks) gently to make sure I didn’t get an infection. Less than half hour later, the hotel owner knocked the door to check we were OK, too. Throughout our stay, they continually checked we were feeling alright. I doubt we will return to Koh Samui again, having only visited this overpriced tourist destination to visit a friend during our trip, however, should we return to the Island, we would be sure to book in to Pandora Lifestyle Hotel.